What kind of green consumer are you? I just went through a 2-day “Earth Advantage Broker” training and the classifications of consumers were interesting. 17% Unconcerneds (does not prioritize environment and society). I fall somewhere between Naturalites and LOHAS – since my car is not a hybrid/EV and my furniture is not necessarily sustainably produced (and neither are my clothes). But I did buy a Built Green Certified homes in High Point (20 homes for resale here if you are interested – a cool mix of condos, carriage homes, or detached homes). And I do a lot of volunteer work to further healthy food and environment initiatives. I went through training to become a Built Green Certified Professional real estate broker in 2007, but I am always interested in learning new or updating my current information. I also am going through EcoBroker training online so it is taking me a little longer. If you have any real estate questions, or green home/lifestyle questions, I am happy to respond in private or on the blog. After all, your question may be the same as someone elses and everyone can learn! If everyone lived like you, how many Planet Earths would it take to support your lifestyle? I am going to be in S.T.A.R. training Wednesday and Thursday – I am adding another green designation to my work, “Earth Advantage Broker”. A preprequisite was to calculate my personal ecological footprint and bring it with me. I think it’s amazing how conscious I am of environmental impact yet if everyone lived like me it would take 4 Planet Earths to do it, and to support my lifestyle it takes 18 global acres of the Earth’s productive area. I still eat meat and I drive a car (and don’t ride the bus). And I eat potato chips. Some things just aren’t going to change. I still think I shouldn’t have gotten more credit for living in a green design home (which was better than living in a 2-4 unit building, I actually live in a 7 unit building). I think in the end it would still take 3 planets. So sad. What is your Ecological Footprint? Take the quiz to find out (it’s fast). A number of the items addressed in this announcement have also been subjects of concern to Realtors® during the past couple of years. The High Point Market Garden Farm Stand has opened in Seattle. Wendy Hughes-Jelen shows off her bag of veggies for $11 and talks about uses, cooking methods, and proper storage to keep them fresh. There are about 20 homes for sale in High Point, a Built Green Certified Community located in West Seattle. If you want to walk to your farmers market, get in touch with Wendy. We all know how important a role consumer confidence plays in any economic recovery, and most definitely in home buying decisions. Now a new national poll of consumer attitudes offers some encouraging news for the months ahead. Wendy Hughes-Jelen (Green Spaces Real Estate.com, Westside Green Living with Wendy on Facebook) speaks of making her dog work for all of her food. Wendy found the “Dog Brick” at Scraps at 2200 Westlake. She has been asking the shop to get them for months, since they were the only shop that knew what she was talking about when she asked. Making your dog work for its food provides mental stimulation for your dog and satisfies the hunter instinct in all dogs. This is Sophia’s 2nd time to use the puzzle and she does quite well! Wendy shows how she prepares the food and the puzzle, and gives some other tips and tricks that might help you with your own dog. Nina Ottosson (Sweden) Dog Brick Puzzle Toy can be found in both wood and plastic versions. The shop where Wendy bought hers only carried the plastic version, which is less expensive. 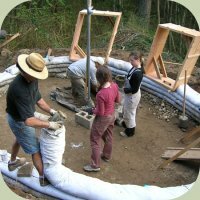 Alderleaf Wilderness College in Monroe (my home town) is holding a 5-day Earthbag Construction workshop August 2nd – 6th. A friend of mine has taken classes there and now also is an instructor. We will be using this structure to explore the basics of earthbag construction as well as hitting on some of the more advanced techniques used in this building form. In-depth discussions will center on key principles of earthbag building such as design, foundations, walls, framing, and roof systems and also the use of local, abundant materials. In this workshop you will learn some of the tricks used in building fast, yet sturdy structures with earth tubes. We will also be covering topics such as thermal performance, strength and integrity, cost effectiveness, empowering community, and sustainability. Taking a class at Alderleaf looks to be a unique experience. You can camp out in the woods during your course, or stay at a motel in town (or go home if it is close enough). You can download the flyer for more information. Help in prairie restoration at the Morse Wildlife Preserve in Graham. Volunteers will collect seeds from prairie plants such as the blue camas and Roemer’s fescue. These seeds will be used at the Preserve by local 5th graders in an experiment on prairie enhancement. Instruction on plant ID and seed collection will be provided but experience in prairie restoration and plant salvage is appreciated. • From WA-512 East take the Pacific Ave/WA 7 Exit. Turn right onto Pacific Ave/WA 7. • At the Roy “Y”, bear left, staying on WA 7. EcoMaven Associates, Environmental Defense Fund, Ashoka, Net Impact, GreenBiz.com and many others invite you to participate in the eighth Green Innovation in Business Network (GIBN) 2010 Solutions Lab to be held at Seattle University in Seattle, Washington on August 10th. To register, please visit the Solutions Lab – Seattle registration page. Solutions Labs – taking place in ten cities around the United States – are one-day events that have the potential to shape sustainable business practices far into the future. Our hope is to give participants an opportunity to share ideas and brainstorm solutions for redefining business as usual – advancing environmentally sound business practices and saving money, while growing the network of sustainability experts and innovators across industries. For general information about the series, please visit the GIBN Solutions Lab Wiki.